For some people one of the many attractions of walking is that you can do it alone and enjoy the tranquillity and beauty of the great outdoors without being disturbed by others. It's an opportunity to get away from it all and to recharge your batteries. There are many others, however, who prefer to walk within an organised walking group and there can be several benefits to be gained by joining a hiking club. Many people look upon their leisure time as an opportunity to meet new people other than their close friends and work colleagues in an effort to forge new friendships and to get a different perspective on life and exchange views and ideas. Walkers are no different in this regard. Additionally, some walkers feel more secure when out walking with a group especially if they're hiking in unfamiliar and sometimes challenging terrain. Usually in these situations, the group will have a trip leader and their help and support can be invaluable and often gives walkers more confidence to tackle walks which they might otherwise have shied away from on their own. By overcoming these hurdles with the help of more experienced walkers, it can often increase a walker's self-confidence and instils in them a belief that they can face other subsequent challenges confidently. There are also plenty of walkers who prefer to join a walking club as group participation usually means that their voice will be heard regarding important matters to hiking in general. For example, the 'freedom to roam' only came about with the help of a vast number of walkers combining forces, assisted by other organisations, to campaign for the right to have access to public or privately owned land for recreation and exercise. Similarly, groups of organised walkers belonging to a hiking club are better placed to campaign to protect landscapes, the public footpath network, long distance walking routes and our National Parks. And, if you have a particular empathy with a specific area of environmental or conservational interest, you can be sure that there is probably a walking club or organisation which is sympathetic to the same cause. A hiking club will consist of walkers of all ages and social backgrounds. One of the benefits of joining a walking club will be that you'll get to meet a whole variety of people many of whom you might not otherwise have come across in your normal everyday life so the social aspect of being a member of a club can broaden your horizons. Also, if you're a beginner, you'll not feel the odd one out as there are bound to be other beginners walking with you which, in itself, creates a common bond likely to result in new friendships. Likewise, there will also be highly experienced walkers who can offer you advice and some useful hiking tips. They'll also be able to tell you the best places to buy gear and many clubs will often have some kind of affiliation with certain youth hostels etc. and outdoor retailers where you'll benefit from cheaper rates and prices. A walking club will also give you the opportunity to venture out to different walking locations and to visit places you may not otherwise have visited. One of the great attractions about hiking is that you will experience something new and different every time you head out on a walk and never more so than when you're walking along different trails in other areas of the county or, indeed, even further afield. And, unlike non-organised groups which can create a problem if there are walkers of different levels of fitness and expertise, many hiking clubs often have separate walks each weekend to suit different levels of ability. For example, Group A may be the most advanced group and may end up going for a 20 mile hike on difficult, hilly terrain whilst Group D may be for 'newbies' who are just starting out with an 8 mile hike on flat marshland. Hi ilive in Bedfordshire and am looking for a regular weekend walking group. Please can you tell me how to join a hiking club? Many thanks. Look in your area (local authority notice boards, community centre, facebook pages etc) to see if there are any advertised. Otherwise the Ramblers Association is a great place to start. 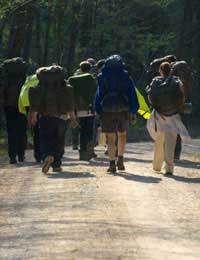 What insurance is advisable for a walking group? We are constituted as a club , with an annual subscription and a constitution, but we do stress that walkers participate at their own risk. If we do need cover, has anyone got recommendations as to the company to approach?Taa. We hope our article helped you. A great place to start looking is the Ramblers Association or you may find one in your local community newsletter/bulletin board/facebook page. @norm - try the Cleveland branch of the ramblers' association OR The LDWA Cleveland. Both have contact details and are local to the area. Happy walking! Hi I am looking to join a walking / rambling club in the Cleveland area, Can anyone please e-mail me any information. hi where in tamworth is therea walking club/ ramblers club and where do you meet? me and my husband are looking to join. The other point about joining a walking club is the companionship. You share a walk (and social activities) rather than going alone. The pace will usually be slower as people talk and point things out, but that can make it all far more enjoyable, especially if you finish in a tea shop or pub. It's worth trying different groups to see if there's one that appeals to you. At the very least you'll end up with a good walk.